In launching a blog, the template is not the only one we should consider to setup. We should also consider verifying our blog on different third party sites offering SEO tools like Google Webmaster tool and Google Analytics. This two SEO tools provided by Google will give you insight about your blog. The Webmaster tool is more on Google Search Engine, it will give you the data what’s happening on your blog before your visitors enter through your links. While the Google Analytics will give you the data on what happened after your visitors visit your blog. According to Netcraft’s survey on March 2012 there are over 644 million active websites on the internet, and surely majority of them are using Google Analytics. We know this statistic will increase yearly. As the result of growing business in the internet the stage of competition to rank a website on the search engine is now difficult race. To know what’s happening on your blog or if your blog is achieving what you expected, you must need to have a Google Analytics. This tool is the leading web analytics on the internet and it can give you the accurate data you need. It will also give you the strength and weaknesses of individual pages of your site. Google Analytics is a free SEO tool provided by Google to all webmasters to easily check the accurate real time traffic and stats on a website. You can also check your Bounce Rate, Goal conversion rate, unique visitor per day and many more free services. Big or small website is using this tool to track what their visitors doing on their website. You know now what benefits you can get if you add this Google analytics on your blogger blog, so let’s start verifying your blogger blog. Go to Google Analytics main site. Sign in with your Blogger Gmail account. Click on Sign Up button from right side part of the page. Select Website to track our blogger blog. Setting up your account (Just fill up the required details). Click Get Tracking ID button at the bottom of the page. Click I Accept Button (To accept Google Analytics Terms of Service Agreement). 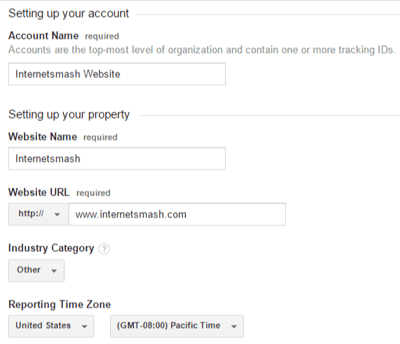 Get the Google Analytics Tracking ID and Tracking Code. Open Blogger dashboard on a new tab ->> Settings and Click Other. Enter the Tracking ID in Analytics Web Property ID’s text field. Click Save Settings on the upper right side of the page. Go to Template Tab and click Edit HTML, then find this code </head> (Press CTRL+F to find </head>). Just above the code, paste the Tracking Code. You have now completely setup your Google Analytics on your blogger website. But it took 24 hours for Google Analytics to show a data about your site’s traffic.